Historically, the Parish Church of St Margaret, Lee was relatively small one serving three small population centres – the area around the church itself on what is now called Lee Terrace, around Lee Green and the large houses of Old Road such as Lee Place, the Manor House, The Firs and Pentland House. The coming of the railways saw the population grow and the ecclesiastical parish of St Margaret was divided several times to form the parishes of Christ Church (Lee Park) in 1854, Holy Trinity (Glenton Road) in 1863 and St Mildred’s on the eponymous Road in 1872. The first two of these have already been ‘visited’ by Running Past and were both lost as a result of World War Two bombs – the churches were partially destroyed, later demolished and not replaced – their parishes being subsumed back into that of St Margaret. The Chapel-of-Ease, then, to the Parish Church, which I purpose calling ‘The Church of the Good Shepherd,’ is to hold 550 persons, all the Sittings are to be unappropriated, so that the poor cannot be crowded out from what is more especially their own Church; and I have sufficient faith and confidence in those who will worship there, to believe that by their offerings, sufficient will be contributed, not only to provide for all necessary expenses of the Services, but also for the maintenance of at least one of the Clergy who will be especially in charge of it. The church was designed by Ernest Newton; Newton has been featured in some detail in Running Past, in an earlier post on another local building that he designed, Lochaber Hall – formerly the church hall of Holy Trinity, Glenton Park. 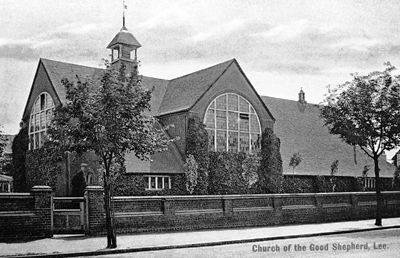 Locally, he also designed the Baring Hall pub as well as St Swithun’s Church on Hither Green Lane. 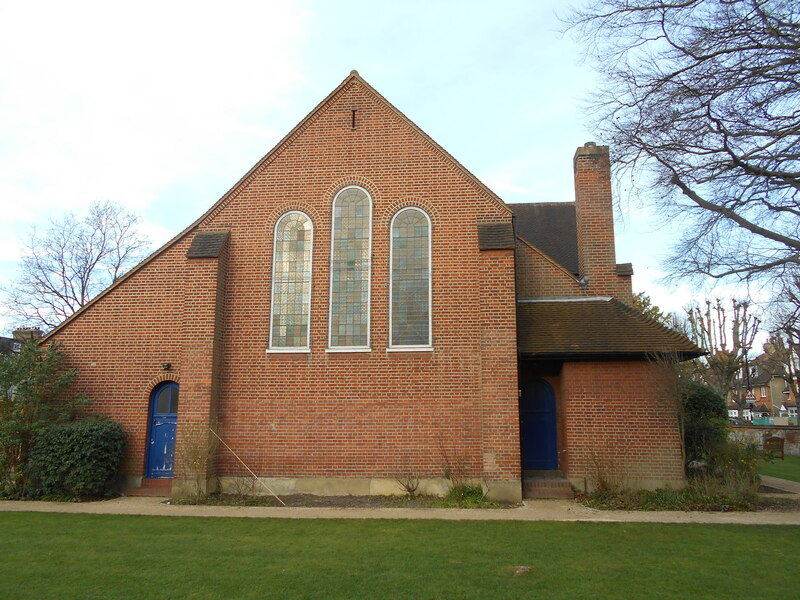 Like St Swithun’s, the builders were the largely ecclesiastical Croydon firm Maides and Harper, they have been described as ‘first-class building firm’ with a reputation for high quality workmanship (photo below – source eBay September 2016). plain, substantial structure of red brick, with tiled roof, and neat bell turret. The interior of the church has a remarkably open appearance, and light is admitted by four large semi-circular windows. He suggested that the ‘fittings’ for the Church of the Good Shepherd church are very plain but substantial – money for them had been raised through a special offertory at St Margaret’s. 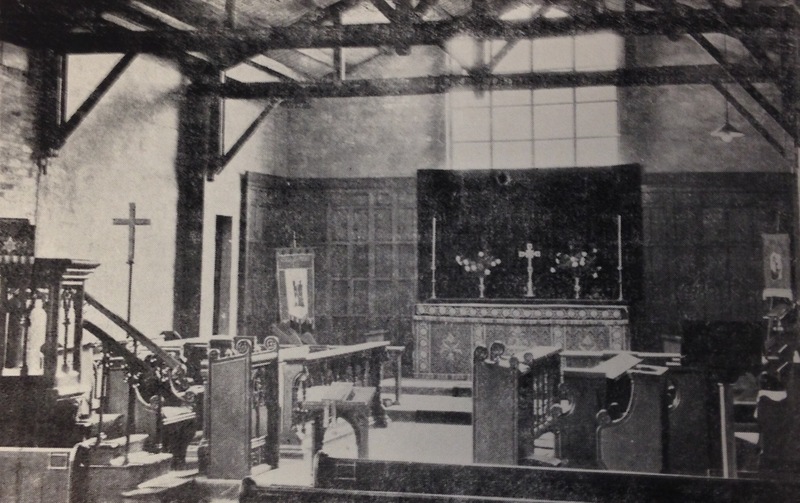 While the building was damaged beyond repair the parish continued to function using the parish hall that had been built in 1892 (2), there were donations from other parishes of an altar cross, candlesticks, pews, pulpits, a font and altar frontals (3). Some of these probably came from other churches lost in the Blitz. For a while, the parish used the church hall of Holy Trinity in Manor Lane Terrace (now known as Lochaber Hall), see below, for Sunday Schools as well as providing a hall for other activities (4). 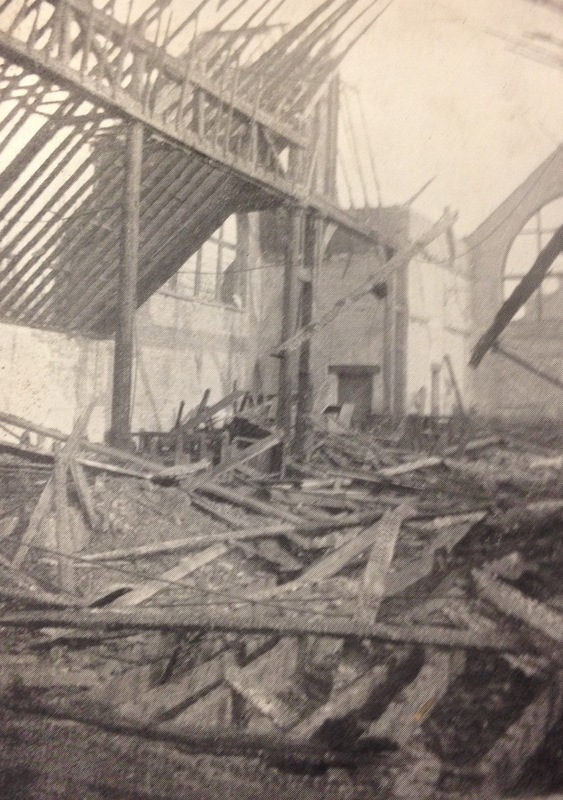 For many local churches and chapels destroyed during the war, the destruction of the physical place of worship saw the end of the parish or church community; in addition to losses of Christ Church and Holy Trinity, the Methodist church on Hither Green Lane and the Baptist chapel at the corner of Eastdown Park and Lee High Road were lost. This was not the case with the Good Shepherd, but the parishioners had to be patient; due to post war shortages of building materials and the priority given to housing, it meant that it was to be seventeen years before it was possible to rebuild the church. The new church was completed and re-consecrated in 1957 and in its rebuilding it was able to use foundations and some portions of the old walls, varying in height from a few brick courses up to some 2 to 3 metres on all the walls, apart from that facing Handen Road. This probably explains the more than cursory nod to the original designs of Ernest Newton, although perhaps had more work been done to the Victorian foundations there wouldn’t have been the problems with subsidence that beset the church around the Millennium. 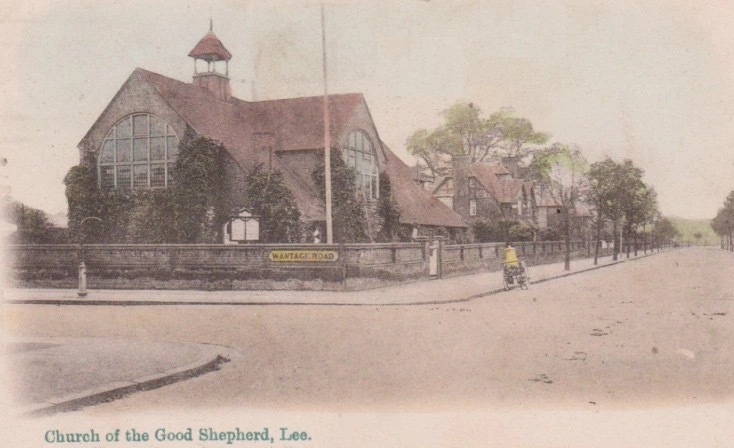 Thank you to the Reverend Shepherd of the Church of the Good Shepherd and Lewisham Archives for allowing me use the photographs of the bomb damage and temporary church (the three black and white photographs in the middle of the post) – they were part of the booklet noted above. This entry was posted in Uncategorized and tagged Christ Church Lee Park, Church of the Good Shepherd Lee, Ernest Newton, Handen Road, Holy Trinity - Glenton Road, Lee, Lochaber Hall on March 30, 2017 by Paul B. 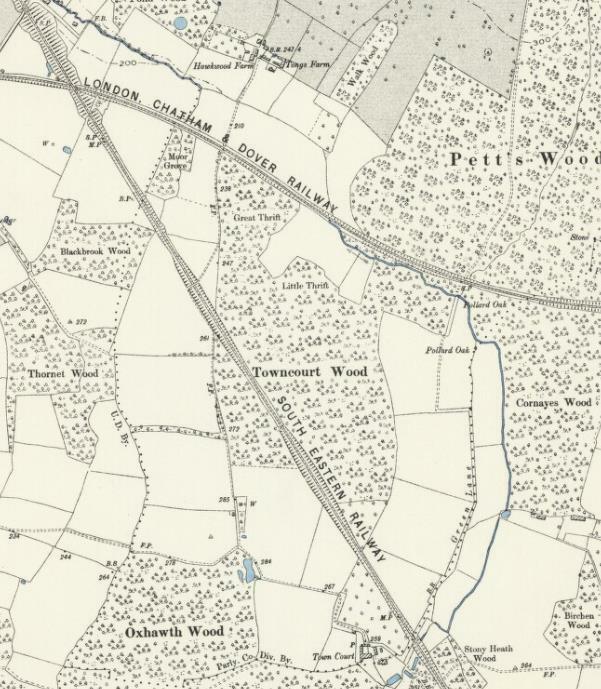 An earlier post followed the Kyd Brook (the name given to the Quaggy in its first few miles) from its two main sources to the confluence – submerged beneath the edge of suburbia of the western edge of Petts Wood. 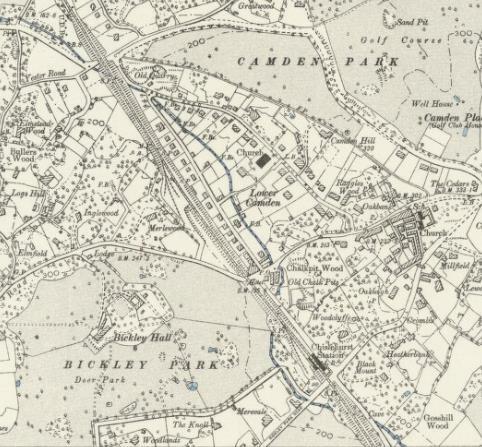 The Ordnance Survey map surveyed in 1894 below, shows where we left the river, close to the former Town Court. The post-development Kyd Brook is submerged beneath suburban streets and, while the roads are too busy to be listening for the sounds of water beneath manhole covers, the course is clear – the miniature valley of the newly combined Kyd Brook is obvious where Ryecroft Road meets Queensway. The river remains submerged as it flows under the railway and then parallel to the former Green Lane, now Tudor Way – there are no obvious remnants of Elizabethan times here although perhaps a nod to the arts and crafts elements of some of the housing. Kyd Brook emerges from its concrete casing just before being bridged by Petts Wood Road, its emergence is greeted by a dissipation of the traffic noise. We are in the ‘high quality estate in a rural setting’ that the 1920s developer of Petts Wood, Basil Scruby intended when he secured an option to buy 400 acres of woodland and strawberry fields in 1927. Like Cameron Corbett at Hither Green 30 years before, he recognised the importance of the railway and built the station before the homes. The front lawns are neatly manicured in what is now expensive suburbia, but parallel to Crossway runs Kyd Brook, between the gardens – it is less constrained by expectations and providing a more natural counterpoint to the street fronts. Of course, appearances must be kept up, and there are quaint colonnaded bridges on the side roads as the river passes. Oddly, for a while, one of the neighbouring streets was home to Charles de Gaulle who lived at 41 Birchwood Road for a few months after the fall of France in 1940. He may have admired Kyd Brook as it crossed Crossway, providing the boundary between two houses, a pleasant alternative to privet or chestnut fencing. When visited almost a year ago, the Wood was a morass of mud; it was difficult to disentangle flooded paths and ditches from streams called ‘Ditch.’ At the end of September, while the two arms of the most easterly of the streams, Petts Wood Ditch, were flowing, some of the unnamed ditches were dry, even to the touch. Petts Wood Ditch used to join Kyd Brook close to the pedestrian tunnel under the railway, but an abundance of wetland plants alongside the path for a while suggests that the confluence may have been moved by Scruby’s contractors. 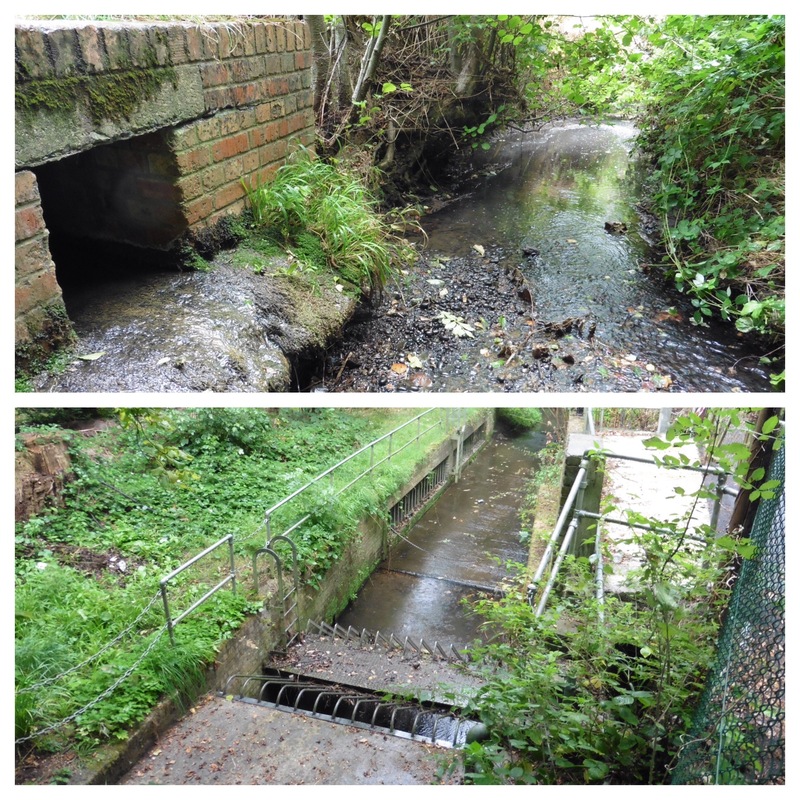 Kyd Brook emerges from an impenetrably dark tunnel under the railways and is briefly followed by a path before heading across the only really rural part of its course – the NT Tong Farm, part of the Hawkwood Estate. 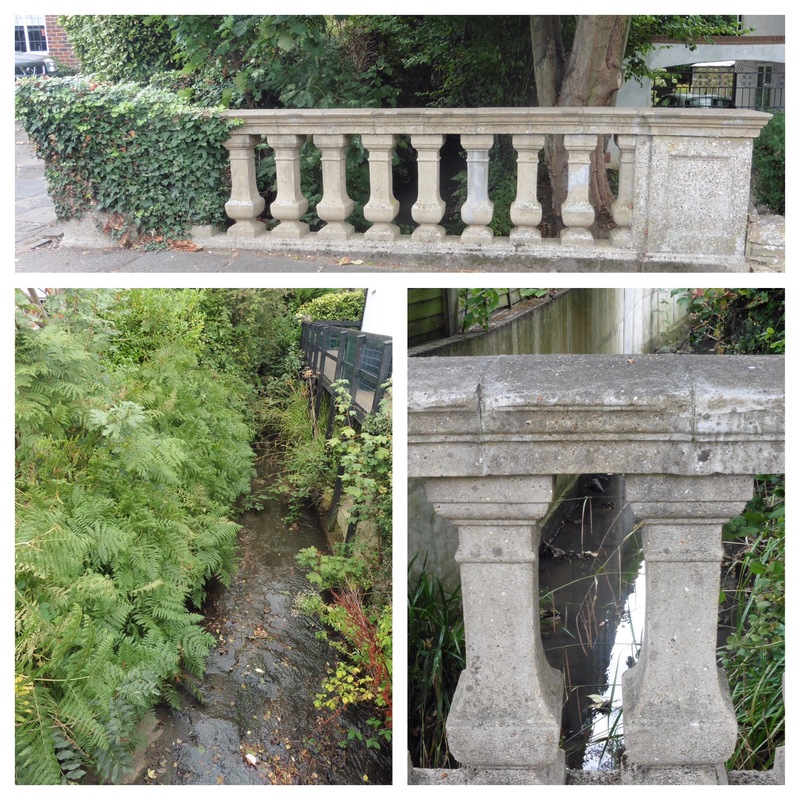 There are several small unnamed streams that come down the hillside from the higher parts of Chislehurst – the confluences are all unseen and all covered in an earlier post on the Estate. There are several small visible streams emerging from the south-west following field edges before being piped under the path to emerge from pipes on the southerly bank of the still Kyd Brook. There is plenty of bird life along the river at this point – although no kites – the Anglo-Saxon meaning of Kidbrooke and presumably Kyd Brook is “the brook where the kites were seen”. 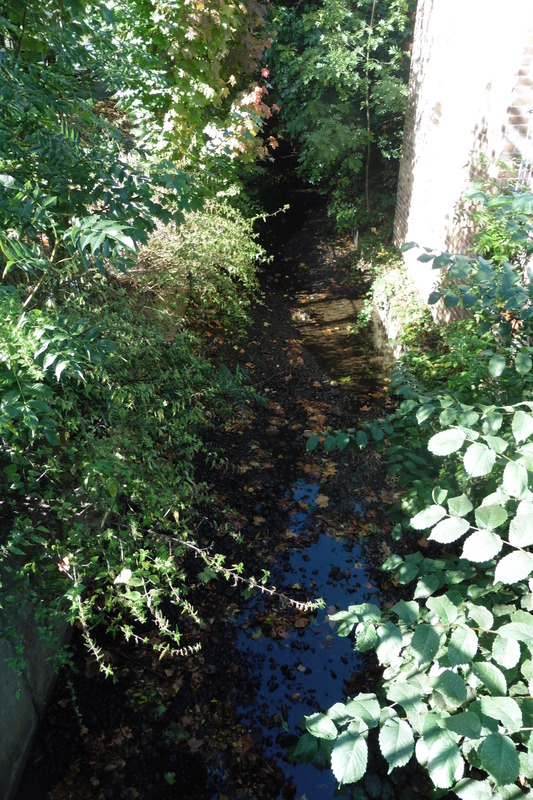 Back in the suburbia of Chislehurst, Kyd Brook is left behind and the river becomes the more familiar Quaggy, but is immediately ‘lost’ to view having been carefully ‘screened’ first. It emerges briefly in a private estate – somewhat less grand than those around its westerly source upstream. The Quaggy is soon again unseen, but it has created an impressive valley, around 50 metres deep, presumably shaped in times when the river was more of a torrent than it now is. Railway engineers have purloined the valley at this point and the Quaggy disappears from view under Chislehurst station. The submerged parts seems greater than in the past – which skirted around the edge of the now demolished Bickley Hall. The stables were designed by Ernest Newton, the architect behind the Baring Hall pub, St Swithuns Church on Hither Green Lane and Lochaber Hall. A rather circuitous wander around the embanked railway sees the river emerge in Bickley, while it is in the open, behind the veritable mixture of architectural styles of Lower Camden, vantage points are few are far between and with several of those the greenery is in such abundance that the Quaggy is audible but barely visible. The Quaggy dips again under the railway’s earthworks, to emerge again alongside Sundridge Avenue, its course largely constrained by unnatural concrete banks. After crossing Elmstead Lane, the river disappears into the grounds of the former mansion of Sundridge Park – now a golf course and conference centre. We will return there another day. This entry was posted in Bromley History, Rivers and tagged Basil Scruby, Bickley, Chislehurst, Ernest Newton, Hawkwood, Kyd Brook, Petts Wood, Quaggy on November 2, 2016 by Paul B.
Lochaber Hall is a rather nondescript looking building, easy to ignore as one goes past, squeezed in between Edwardian and late Victorian housing; but on election days, like thousands of other halls, community centres, schools and other buildings it takes on great importance – it is a Polling Station. 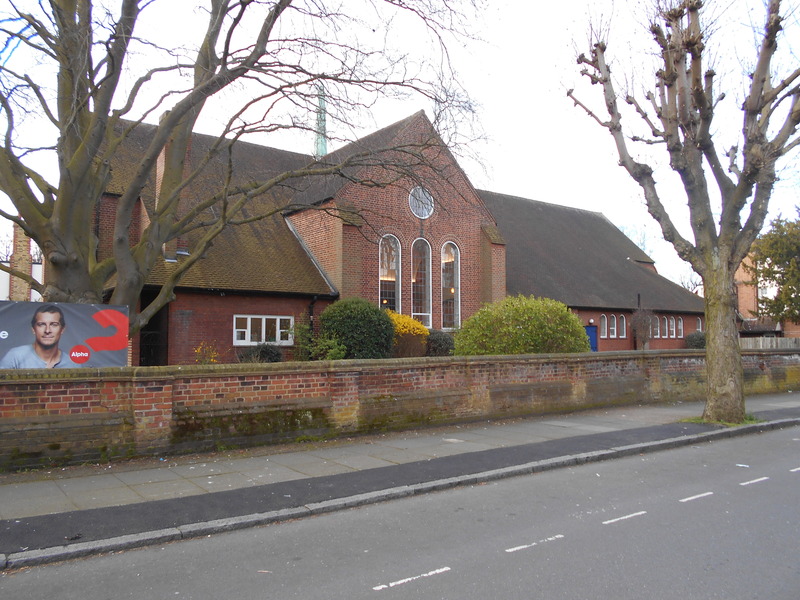 It looks like a church hall because that is exactly what is was; it was built in 1910 as the church hall for Holy Trinity in Glenton Road – quarter of a mile away on the other side of Lee High Road. The Hall was built on some of the last bits of farming in the area – Manor Nursery, the nursery had been built as kitchen gardens around 1800 by the then owner of the Manor House, Sir Francis Baring, its collection of fruit trees was described in 1882 as ‘one of the best on this side of London’. Some of its boundary walls predate its current usage. One storey building with gable end to road. Multi-coloured stock brick. Wide, fairly high pitched, slated roof with overhanging eaves at sides and brick dentil cornice in gable. Also in gable large, four-light, square-headed window with brick arch in 2 planes and flanking brick pilasters. Angles of building emphasised by gabled buttresses breaking roof line. 5 side bays defined by buttresses with sloping step just below eaves. Projecting ground floor, with brick-quoined centre, has recessed porches at outer corners, with overhang resting on stout Doric columns. Holy Trinity was bombed during WW2, it was covered here a few weeks ago in the blog and the only obvious link is now a dedication stone at the front of the Hall. 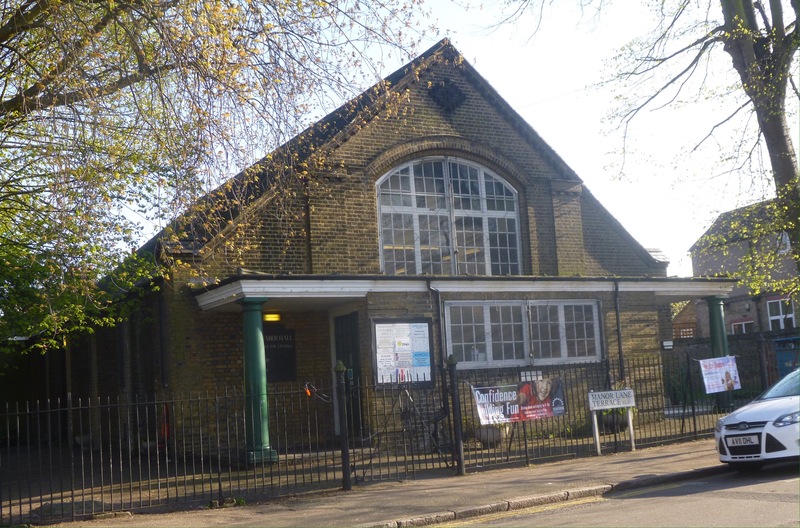 Other than its occasional use as a polling station, it is a well-used community resource with two halls. 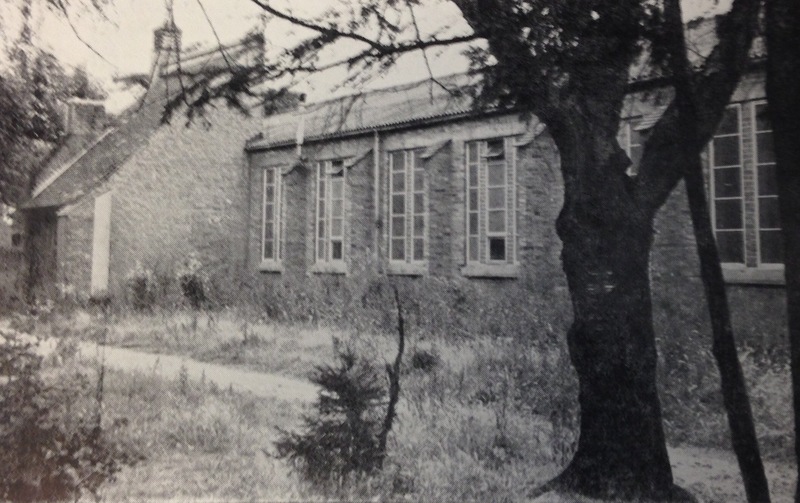 The smaller of the two is in extension at the back, the Jack Poole Annexe, is in memory of a former ‘caretaker’ of the Hall. Jack was a genuinely community spirited man, looking after the Hall but reporting any dumped rubbish, street lights out and the like – he badgered Lewisham Council until the problem was sorted out. Jack used to live in my street and if he was still alive would have almost certainly have had a Labour Party poster displayed in his window – he always did whatever the election and he sometimes had ‘committee rooms’ there. I’ll undoubtedly think of him as I pass his house, it is still his in my mind, on my way to cast my vote. This entry was posted in Lewisham History, Listed Lewisham and tagged Ernest Newton, Jack Poole, Lochaber Hall on May 6, 2015 by Paul B.